1. 97% of scientists agree that the climate is changing dangerously because of human activities. 2. Dangerous Man-made Global Warming caused by greenhouse gasses is just a matter of basic physics, like the theory of gravity. 3. There is evidence of an ongoing amplified/accelerating greenhouse effect. 4. It is impossible to explain most of the warming since 1950 with natural causes, and thus we must conclude that it is mainly Man-made. 5. There are ample signs of Man-made Global Warming – melting ice, rising sea levels, more extreme weather, warming oceans, ocean acidification and coral bleaching. 6. The U.N. IPCC is a scientifically credible organisation. 7. Computer models reliably predict future climate. 8. No-one profits from promoting anthropogenic global warming. 9. Mitigation of climate change is all positive regardless of whether it is Man-made or not. 10. Better to be be safe than sorry – taking climate change seriously is like an insurance in case it really is Man-made. 11. It’s a good thing that we end our addiction to fossil fuels anyway. 97% of scientists agree that the climate is changing dangerously, mainly because of human activities. This argument from authority is probably the most convincing of all to non-scientists, and probably also to scientists who are not specialised in climatology. It’s not really a scientific argument, of course – science is not done by majority decisions, but it’s still scientific in form, i.e. it makes an empirical claim that is testable. In most cases it’s really quite smart for non-experts to trust experts, because everyone cannot know and fact-check everything. We all know that experts can be wrong, even a large majority of experts, but most of us aren’t a Galileo or Einstein with the brains to challenge a scientific consensus. The problem is that this way of thinking also makes us susceptible to manipulation (if that ever happens), and in some cases, when there’s a lot at stake, it might be a good idea to try to think for ourselves and listen to what the “crazy fringe” sceptics have to say. To start with, we should at least try to verify if there really is anything like a consensus on the issue at hand. In this case the consensus is actually a myth and not a verified fact. It is based on heavily flawed studies that NASA should be ashamed to promote, and reporters should be ashamed not to scrutinize more thoroughly. None of them is done by climate scientists, not even STEM-scientists. 1. the global mean temperature has increased since 1880 (but how much?). 2. the amount of atmospheric greenhouse gasses has increased, to a large part because of emissions of carbon dioxide from the burning of fossil fuels. 3. an increase of atmospheric greenhouse gasses is likely to have some effect on global temperatures (but how much?). This is not nearly enough to verify the claim in Argument #1. Even most sceptics of dangerous anthropogenic global warming agree to these points. But they don’t agree that the increase in atmospheric greenhouse gasses is the main, or even an important, driver behind climate change. They generally consider the mild warming since 1880 as part of a natural climate cycle that is not likely to be dangerous. But many of these sceptics are included in the 97%, just because they agree that greenhouse gasses may have had at least some effect on global temperatures. Scientists like Craig Idso, Nicola Scafetta, Willie Soon, Nir Shaviv and Nils-Axel Mörner are all famous for their skepticism of anthropogenic global warming, but are included in the 97% consensus. They have all explicitly stated that their research papers have been misinterpreted. In the study by Cook et al (2013, see below), a survey of the Abstracts of scientific papers, they are included in the category labelled “explicitly endorses but does not quantify or minimize” (i.e. they don’t say anything about how large the human influence is). Furthermore, many of the papers included in the 97% are not concerned with the causes of climate change, but merely accepts the consensus as a starting point, e.g. in the study of probable consequences of global warming for the economy or for certain animal species etc. Cook et al calls it “implicit endorsement”, and include them in the 97% consensus despite the fact that the authors of the papers have no expertise in the science involved in Argument #1. Finally, although Cook et al claims to have studied 11 944 scientific articles, in the final result they disregard the 66,73% of the articles that stated “no position”. A charitable interpretation would be to just discard of the 66,73% of the papers with no position, whereby the number would be 1,6% instead, i.e. 64 out of 3974. The point, of course, is not to claim that ether of these numbers is closer to the truth, but to reveal the manipulative nature of these studies. The fact that NASA promotes this biased nonsense, and no journalists expose it to the world, is a bad sign of either sloppiness or serious bias or both. So, Argument #1 clearly seems dishonest and designed to stop people from even listening to the “crazy fringe” sceptics. That should make anyone very suspicious and eager to do just that. In reality, it would not be very surprising if the majority of scientists at some point is shown to agree with Argument #1, because that seems to be the required credo for receiving research funding nowadays. So far, however, the sceptics are far more numerous and qualified than the myth implies. But what about all the scientists on the UN Intergovernmental Panel on Climate Change (IPCC) that summarize the best and most recent research? Why would they all support the position of the so-called consensus if they didn’t believe it to be true? I will return to these obvious questions, but what really matters is the scientific evidence. So first, let’s have a look at the proper scientific arguments on climate change. Dangerous Man-made Global Warming caused by greenhouse gasses is just a matter of basic physics, like the theory of gravity. This graph represents the mainstream view presented to us by the UN IPCC, NOAA (the US National Oceanic and Atmospheric Administration) and NASA-GISS (Goddard Institute for Space Studies, a department of NASA – which, by the way, had nothing to do with the Apollo program). But it is not just basic physics. True enough, the warming effect of greenhouse gasses as such is close to being accepted as basic physics. 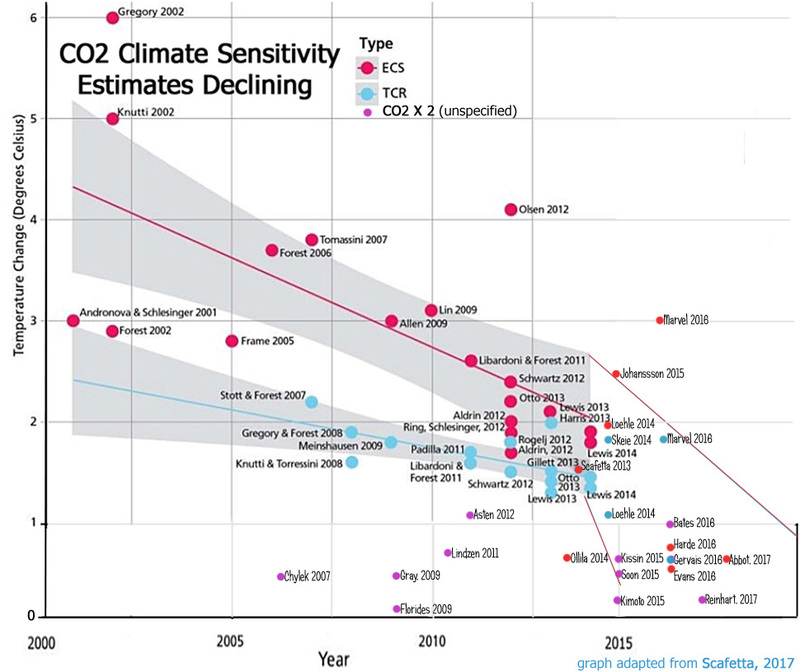 Nevertheless, Argument #2 is false, because the basic physics of greenhouse gasses does not warrant the simple lock-step correlation between atmospheric carbon dioxide and global warming implied by the graph above. “Dangerous anthropogenic global warming” is a hypothesis requiring controversial assumptions about still unresolved scientific issues in addition to the basic greenhouse effect. A temperature increase with 1,1°C from preindustrial levels requires an increase of carbon dioxide from 280 ppm to 560 ppm, from todays approximately 400 ppm to 800 ppm, and from there and increase to 1600 ppm. More and more carbon dioxide is needed to cause the same warming effect. The same goes for other greenhouse gasses, like methane. Todays levels are only about half the increase required to cause the more than 1,1°C warming shown in the first graph above. Of course, there are also natural climate drivers, like variations in the amount of energy the Earth receives from the sun, as well as other anthropogenic factors, but the effects from these are controversial and far from just a matter of basic physics. According to NOAA, NASA and the IPCC other natural climate drivers are not enough to explain the modern warming. The anthropogenic global warming hyothesis requires assumptions about amplification from positive feedbacks in the climate system, i.e. secondary effects that further increases the warming from the greenhouse gasses alone. The direct warming effect from an increase in atmospheric greenhouse gasses will, for instance, in turn cause more evaporation from the oceans, because warmer air can hold more vapor. And water vapor is the most important greenhouse gas, much more effective and dominant than carbon dioxide or all the other greenhouse gasses together. More water vapor leads to more warming that leads to even more water vapor in an accelerating vicious circle. The hypothesis of anthropogenic global warming requires a threefold an amplification, mainly by water vapor, of the direct effect of greenhouse gasses, in order to explain the warming since 1880. The worst-case scenarios for the future are based on assumptions of even stronger amplification from positive feedbacks, with up to 6 times the direct effect from carbon dioxide alone. Those scenarios are the one’s normally picked up by media and other groups wishing to profit in one way or another from the perception of an imminent climate catastrophe. There is overwhelming evidence of an ongoing amplified/accelerating greenhouse effect. Actually no. Not at all. Of course, these results have been questioned, and others have got other results. This is not surprising, even a widely respected researcher like Dr. Richard Lindzen gets criticisms, like everyone else. And of course they have replied (Lindzen & Choi 2011). If nothing else, it proves that the scientific debate on the causes of climate change is far from over. None of the predicted effects of an amplified greenhouse effect has been confirmed. No accelerated specific humidity, no “hot-spot” and no decrease in infrared radiation to space. On the contrary, as the Earth has warmed, the infrared radiation to space has increased, which suggests either that negative feedbacks totally dominate, even negate, the positive ones. But that seems odd – warming that through negative feedback cause cooling? A more plausible interpretation is that the warming is not caused very much at all by the greenhouse effect, but rather that the Earth has received more energy from the sun, either by increased solar activity or by less cloud cover, or both. These two factors may even be causally linked, as I will explain later on. So, there seem to be no relevant evidence för an amplified greenhouse effect, rather to the contrary. It is impossible to explain most of the warming since 1950 with natural causes, and thus we must conclude that it is mainly Man-made. This is a more complicated argument to refute, but it is certainly doubtful that it is correct, not merely because of the obvious logical fallacy of excluding the possibility of natural causes we yet don’t know about. It also not likely that the global temperature has increased as much as the argument requires. And the warming from 1800 throughout the 20th century correlates to a long period of increasing solar activity. According to the official story it is not possible to explain the majority of the sharp warming after 1950 without reference to the influence of increasing atmospheric carbon dioxide, of which a large part is proven to have its origin in human activities. But this is not the only official or otherwise credible story, and there are actually good reasons to question how much the globe has actually warmed. Such “administrative adjustments” are regularly applied to the data provided by the ground-based whether stations around the world that is the source for these temperature curves. Missing data is filled in (many stations are run by amateurs), data is altered when equipment has been changed or moved or when a station reports otherwise questionable data. There is nothing intrinsically wrong about that, but there is lots of room for arbitrary or even biased judgements, which is part of why these graphs are less reliable than graphs based on data from satellites or weather balloons. Some adjustments, like the “time of observation bias” has been shown to be flat out wrong, and the so called Heat Island Effect (from urbanization) has been taken by NOAA to be generally reversed by other changes to the stations. However, the very large adjustments made by NASA-GISS to their own old data is certainly questionable and seem to be far from justifiable. This graph also shows that the variations in temperature are correlated with, not atmospheric carbon dioxide, but with the regularly occurring warm and cold phases of the ocean currents in the Atlantic. In fact, all the warming that NOAA, NASA and the IPCC claims cannot be explained naturally and therefore must be caused by human emissions of greenhouse gasses, is created by these “administrative adjustments”. Which means, ironically, that global warming actually is Man-made. Finally, the problem that the variations in solar output are too small to account for large temperature variations on Earth may very well have a solution. Satellite data are the most reliable we have, because they cover the whole globe circling the poles, and are not adjusted at all. Corrected, yes, due to very well known and precise orbital deviations, but there’s no need for complicated “administrative adjustments” involving, for instance, infilling of missing data or other uncertainties. The warming during the past 150 years may not mainly be a result of human emissions of greenhouse gasses, perhaps not a greenhouse effect at all. Unsurprisingly, this hypothesis has not been very popular among the mainstream, state-funded scientists that depend for their livelihood and academic career on man-made global warming. Regardless, it shows that there may be plausible natural explanations to climate change outside the established box. The problem today is, I think, that not many are looking for them, because the money is in man-made global warming. This doesn’t look like “global” warming. Secondly, the fact that land is sinking i New York is not merely due to the weight of constructions, but also the corresponding effect of land rising i the north, both connected to the weight of the enormous glaciers that covered large part of the northern hemisphere in the last ice age. Land being pushed down in the north also meant land being lifted further south beyond the edge of the ice. Ever since the ice started melting the process reversed. Thirdly, there is a fundamental misconception regarding choral islands, that they are under threat of being engulfed by rising seas. On the contrary, choral islands grow when sea levels rise. There is a reason why they are som low, right above the sea surface, namely that this is what they adapt to. (New Scientist, 2 juni 2015)]. One might assume that data from tide gauges are generally very reliable, since they also have an important practical use for shipping – to be clear, even lives are at stake. Some weather stations are also like that, for instance at airports, but in many cases the data is reported by amateurs. And while temperature data from satellites are the best we have regarding temperature, it’s not as simple to measure sea level. Therefore, one might be justified in trusting tide gauges over satellites when it comes to seal level, in case the respective data series don’t align. To begin with, “acidification” a misnomer. The oceans are not and are not turning acidic. The issue is that increasing levels of carbon dioxide may make the oceans less alkaline, but the problem is still the same, if marine life is sensitive to changes in pH. The worlds corals have been around for a long time, and have survived both higher (and lower) temperatures and carbon dioxide levels. That is not to say that they haven’t been severely damaged from time to time, to eventually recover. Coral bleaching is a natural process that occurs once in a while. It can be caused by rapid temperature changes – both warm and cold – but more importantly by intense sunlight that makes chlorophyll reactive and toxic. This is why the corals rid themselves of the algae containing chlorophyll, which in turn makes them white – but not dead, although very stressed, because they get 90% of their energy from algae photosynthesis. Normally they recover within a few years, and even though a proportion av the corals actually die, the reefs are fully restored with time. The bleaching events on the Great Barrier Reef 1998 and 2016 were caused by the effects of the weather phenomenon El Nino, that actually means calmer and more steady weather conditions, that cools the ocean surface waters, in this part of the world, but also less cloud cover and hence more sunlight. That’s also why it’s the fast-growing corals in the shallow that are mainly affected by bleaching, not the slower-growing ones on greater depth. Different coral species react differently to environmental disturbances, including temperature changes, diseases, variations in salinity as well as changes in sunlight, e.g. because of muddying of the water, but a main problem is of course toxins and other waste products, but also fresh water. The most severe threat to corals is probably, as in the case of the Great Barrier Reef, the over-enrichment of nutrients (eutrophication) from human waste, that also greatly promotes coral bleaching. The scientists in the panel produces an extensive report covering Physics, Effects and Mitigation. But this material is then supposed to be summarized in the “Summary for Policymakers”, which is the document that is actually read by politicians and journalists. But this summary is, in reality, the result of political deliberations and negotiations, and does not always reflect the underlying science. The first is precisely that of “appropriate input”. Our understanding of the details of climate and the drivers of climate change is incomplete. We don’t fully understand cloud formation, for instance, or the effects of aerosols. When climate models are calibrated some of these factors are adjusted to fit historical records, but since our knowledge is incomplete the margin of error is big, and there’s a risk they are used as “fudge factors”. More importantly the physical laws programmed into the depends on a proper understanding of the processes involved in climate change, most notably the sensitivity of the climate to changes in atmospheric levels of greenhouse gasses. No-one profits from promoting anthropogenic global warming. I don’t think so. In reality sceptics are silenced, shunned and harassed, as though they were “heretics” or evil. Why is that? Who benefits from promoting the idea of the imminent end of the world due to the “sins” of humanity? Well, it rings a bell, doesn’t it? It’s an old theme, used through history for power, revenue and control – and always effective despite never really happening. Today it’s not the priests and the church preaching, but other professionals and institutions. Media is also an obvious winner on the global warming gravy-train. Their appetite for startling headlines is satisfied more or less on a daily basis, and global warming may certainly be one of the most profitable issues in modern times. The worse the catastrophe, the better, and the climate news often exaggerate and rarely scrutinize. “Don’t ruin a good story by fact checking it”, seems to be their motto. All companies today are eager to project environmental care onto their trademarks. being “green” to save the planet has become a selling point. But some companies, especially those in the “renewable energy”-industry have, of course, benefited enormously from subsidies. Especially within the ideological left man-made global warming is regarded as a lever to promote a political agenda, for instance to redistribute the wealth in the world, even primarily and regardless of the scientific evidence. As mentioned in the comment in the graph, the effects of the global warming crisis also have immeasurable psychological effects that it is impossible to know in what way they will affect the productivity and lives of people. What amount of possible positive effects of non-existing global warming are worth millions of children growing up worrying about the future and in many cases losing hope? Then we have to consider the political consequences – mitigating global warming requires international agreements and, according to some, even a “temporary” dictatorship by a world government, to ensure compliance. Sky-rocketing carbon taxes, “cap’n’trade”, misguided subsidies and general waste of money will make us all poorer, which probably in the end will be detrimental for the environment from all aspects. Environmental care increases as societies grow wealthier, so that’s probably what we should focus on instead. Wealthier societies also grow more resilient to all kinds of disasters, including climate change, natural or not. It’s true that some investments in renewable energy and “green” technology will stimulate economic growth, but if anthropogenic global warming is non-existent, most of it will be a waste and of now use. To be clear, there are many attempts to calculate the cost of “doing nothing” – having no insurance – but it’s fair to say none of them are trustworthy. They are just estimates. But “doing nothing” isn’t really that, but rather “not implementing specially designed climate mitigation policies, such as subsidies to ‘green technologies’, sky rocketing carbon taxes and other measures to impede the use of fossil fuels”. It means letting the free market take care of the problem through growth that creates wealth and climate security, and innovation that creates ever more efficient and cleaner technologies and energy resources. The use of fossil fuels will be extremely beneficial, until we invent other forms of equally cheap, plentiful and reliable forms of energy. In my estimation, then, “doing nothing” will also cost nothing, but rather be very positive economically. On the other hand, doing “something” will, in my estimation, probably impede growth and increase poverty – and all the problems that goes along with that, not the least a larger vulnerability to natural disasters and climate change. If we ought to prepare for the risk of catastrophic global warming, we certainly should get an insurance for global cooling as well. Not only because there’s a considerable chance that the world will enter into a new Little Ice Age according to the Solar Cycles, but also because we are just one big volcanic eruption away from decades of a dark, global and bitter cold all-year-round winter. If that happens, fossil fuels would be helpful while solar panels and windmills (and even hydroelectrical power) would be useless. It’s a good thing that we end our addiction to fossil fuels anyway. I think it’s fitting to end this essay by commenting on carbon dioxide, this essential substance that plays the central role in most of the arguments above. Carbon dioxide has been framed as a villain, and some countries are including it as a pollutant in their legislation. Of course because of it’s alleged role in the hypothesis of dangerous anthropogenic climate change. I hope I have thoroughly refuted that idea, but even regardless we need to remind ourselves of the whole truth about this substance and all it’s benefits. What we actually see is not “carbon”, but a plume of water vapor from the shadow side. Fifty years ago coal power plants emitted a lot of soot, but that’s history, at least in modern plants. The preindustrial climate is often represented as “natural” and “ideal”, but nothing could be further from the truth. The industrial revolution was preceded by 500 years of bitterly cold climate, with bad harvest, social unrest, decease and war. The Swedish chemist Svante Arrhenius, one of the early scientists calling attention to the greenhouse effect, was enthusiastic for the prospect of a warmer climate, and during the Global Cooling scare in the 1960’s and 70’s the horror was a possible return of a Little Ice Age like the one in preindustrial times. Neither was the level of atmospheric carbon dioxide in any way ideal, but rather close to the limit at which plants start to die. “Natural resources” are not a fixed quantity, but the result of human ingenuity. In fact, the most important natural resource is human creativity.